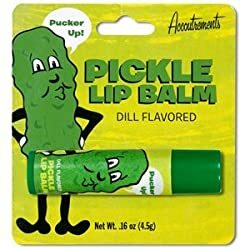 Pickle Lip Balm When it comes to my lips, I eschew the vlassic flavors. So with this item, the heart said yes though the brine said no. Apparently, the taste wasn't kosher for Brad, who can be a sour puss, even when in the balm of your hand. So you might want to pickle little more carefully, and give your spouse more than lip service. Now I just say there's a pickle in my pocket and I'm happy to see him. Too cuke for words.